On Gluten Freedom, I’ve shared with you many things about me. Many nerdy and quirky things about me. You know that I love ‘The Bachelorette.’ Did you see last night’s episode?? Frank is pitiful. I once again vowed that I’m never going to watch another episode of the show. You know that I love famous chefs and folk music. Um, Indigo Girls are playing in Atlanta on October 15th. Mark your calendars! One of the other things that I love which I haven’t really shared with you is musicals. To quote Tobias Funke from ‘Arrested Development,’ (a great show, by the way…much better than ‘Bachelorette’) I love the “theeeater.” As a child, my favorite family trip was to New York City where we saw three musicals in 48 hours. 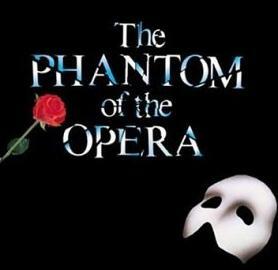 This trip would be my husband’s worst nightmare, but he politely puts up with my love of musicals, nonetheless. Peyten suggested Taqueria del Sol as it’s apparently a quick stop for a meal, despite the long line that’s always stretching out the door. I had never been to this beloved Atlanta spot, as I’m weary about places that serve food quickly and en masse. 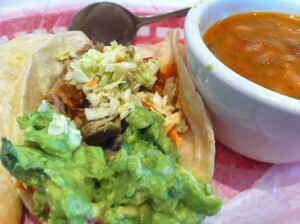 Thanks to blogger, Celiac Eats, who loves Taqueria del Sol, I was willing to give it a try. As the time for dinner got closer, I became more anxious about the impending meal. (I know that’s weird for you non-celiacs, but going out to dinner can be very scary, especially when you’ll be confined to a theater seat for the next three hours.) I texted my friend, Anne, (also celiac) and asked her opinion. She was lukewarm on Taqueria so I began to plan on eating dinner prior to the Taqueria stop. David encouraged me to call ahead, just in case, and I did. He’s full of great ideas. The manager, with whom I spoke, has a gluten allergy herself. She knew everything I could eat and was very specific, which I love. She even told me that I can have chips if I come for lunch, but not for dinner because at that point the fryer is contaminated. Such helpful information! Most of the enchiladas are totally gluten free and the corn tortillas can be substituted for the tacos. They were some of the best corn tortillas I’ve ever eaten. 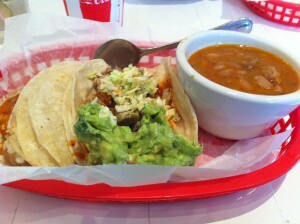 For dinner, I ordered one Memphis taco and one Veggie taco, with a side of the Charros beans. I also got some guacamole because I can never resist guac. The brisket taco is also gluten-free so I’ll try that one next time. Both of my tacos were delicious. The Memphis comes with smoked pork, jalapenos, bbq sauce and cole slaw. A perfect combination. Sweet, salty and crunchy. (I love weird combos and combining textures.) The veggie taco was delish as well! I enjoyed my meal while sipping on a tequila and tonic. Yes, a tequila and tonic. Don’t knock it ‘till you try it. I promise, you’ll love it. Just think margarita, without the too tart, too sweet grime that stays on your teeth. As I mentioned, Taqueria has an intimidating line out front, but it’s worth it. You can walk to the bar and order a drink to enjoy while you wait in line. The line moves fairly quickly so it looks worse than it is. I’m so glad to discover another spot in Atlanta where I can grab a quick, and relatively cheap meal, that’s gluten-free friendly. And of course, we made it to the Fox in plenty of time and I thoroughly enjoyed the show, trying not to sing along. Afterwards, I did have trouble explaining to David why I think ‘Phantom of the Opera’ is so good. It just is. I saw Phantom at the Fox too!! I too have always been a sucker for that one – really anything having to do with Paris gets me. And I’m going to Taqueria tomorrow night with a friend! You and I are channeling each other I suppose. I’d love to play soon!! Glad you enjoyed it! I’ve never thought of a tequila and tonic – I’ll have to try it out. 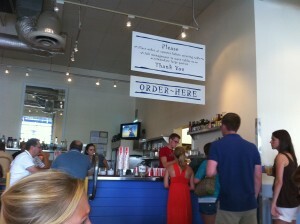 Um, this blog touches on 2 of my favorite things…Taqueria and Musicals! Go Gluten Freedom! Although I dig tequila and tonic, you just cannot beat the margs at Taqueria. I’m glad we can finally go here together. We must go for lunch soon–the chips are hot and salty! Remind me to tell you about my run in Paris trying to get the Bastille while listening to Les Mis on my ipod—gotta love musicals! We saw Avenue Q in London–have you seen it?? I just ate there for the first time today. 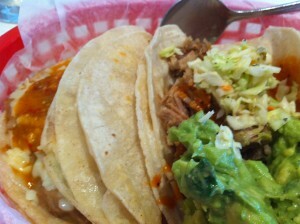 I agree, the corn tortillas were fabulous and the beef brisket were my favorite. The Memphis was also tasty. However, the guy taking my order told me not to eat the chips. I was there at 11, first thing, but he could not assure they had not yet been fried with anything, and I wasn’t willing to take the chance, since I have experienced a glutening by chips before. I guess next time, I will ask again and see if the answer is more like what you got, or what I got today. The salsa sure looked good, I should have just asked for some warmed tortillas to eat with it. Yes, I’m yet to try the tortilla chips as well. Last time I went, I ordered the guac and asked for corn tortillas, which they gave me. It was pretty yummy.